Once again, the Champagne Quilters met to work on the baby quilts. 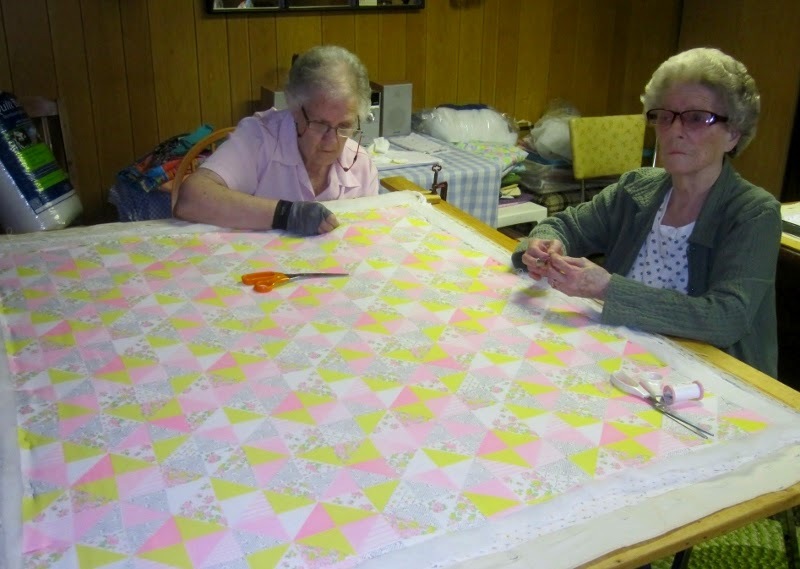 Here's Ann and Marg working on the pre-printed quilt top. With so many lines, Ann was having trouble just working on the diagonal so Marg thought it would help if she worked alongside her. We found that we were low on our supply of white quilting thread so we're hoping Fabricland will have a sale soon. This is the one I worked on last night. We were a bit late getting to Marg's so it was a slow start. Nevertheless, I did manage to get several turns on the frame. 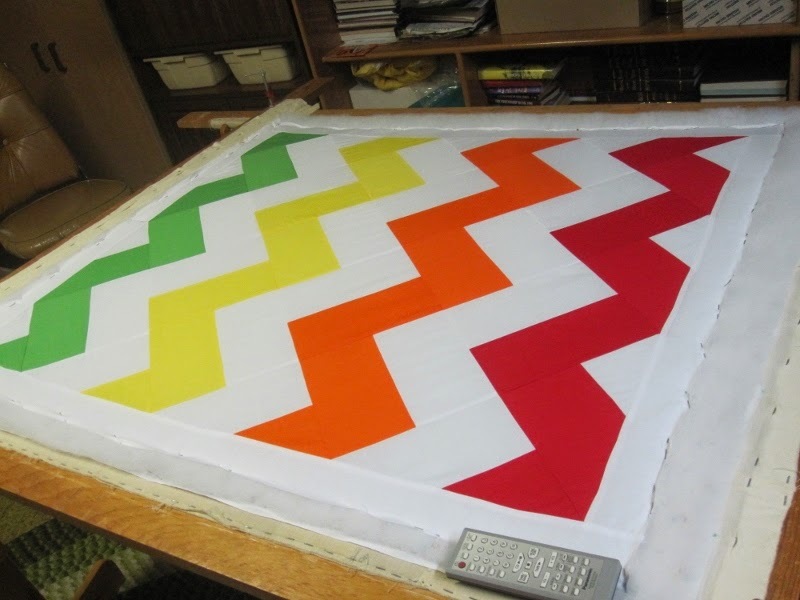 I'm hoping on finishing the quilting next week so I can begin one of the other ones. This one worked up surprisingly fast. We thought we'd bind it with either the orange or the yellow. 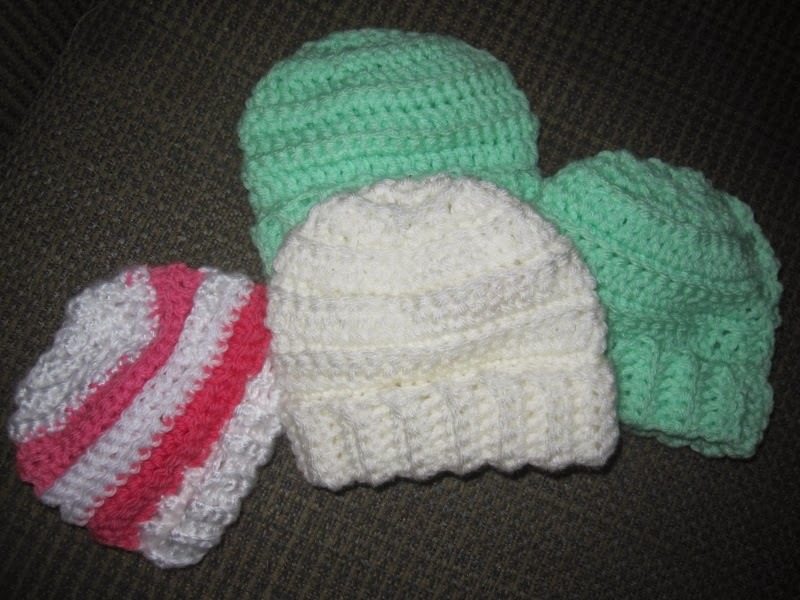 Marg managed to make four more baby hats using the leftover yarns I have been giving her. This brings a total of 21 hats that she has made. Once all the baby quilts have been finished, I'll deliver them, along with all the hats and flannel blankets that I have at home. Nice baby quilts and tiny hats! I have started a new set of those hats too, they are such fast little projects to have by the TV table. oh, and I think it's so nice that you make the tiny hats ... and little blankets. Way to go ladies!! A wonderful contribution, and always lovely to work together. Lovely quilts - and four new hats, yay! Dolores, I think whoever receives those baby quilts and baby hats will be very lucky. The quilts look lovely and the baby hats are adorable. The baby quilts and hats will put a bit of extra love in the babies' lives. 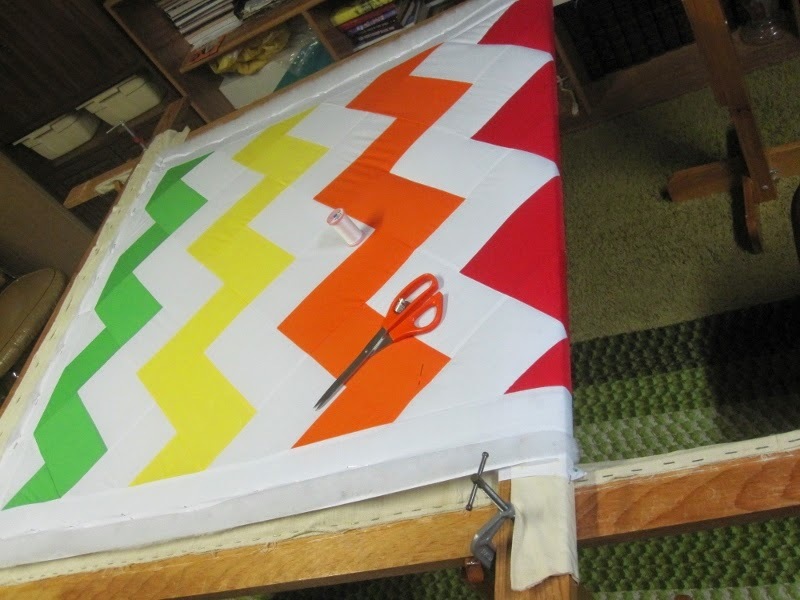 It must be motivating, to quilt when there are others quilting too! Thank you for the show. You took such great pics. I especially love the selvedge quilt! Pretty nice time I'm sure and wonderful work too!